Rays started congregating here in 1996, when the owner of Los Gigantes Dive Centre had the bright idea of starting an organized stingray feed to attract more divers to the area. The rays responded with as much enthusiasm as the paying guests, and before long, enough animals had overcome their natural fear of bubble blowers for the feed to be pitched as a “guaranteed encounter”. Unlike the ray experience at Stingray City in the Cayman Islands, the feed at Los Gigantes attracts many different species of rays including a few gargantuan roughtail stingrays that probably weigh upwards of 300lbs. The most abundant species in attendance are usually common and round stingrays, both of which can be seen circling the anchor chain as soon as the dive boat arrives. Other regular participants are common eagle rays that soar back and forth scooping up fish scraps as they drift away from the chum barrel. Some of the smaller rays try to work their entire bodies into the bait barrel, while their larger cousins use their bulk in an attempt to separate the barrel completely from the feeder’s grasp. The ensuing battle of wits is an entertaining spectacle that can last for a good ten minutes or more. 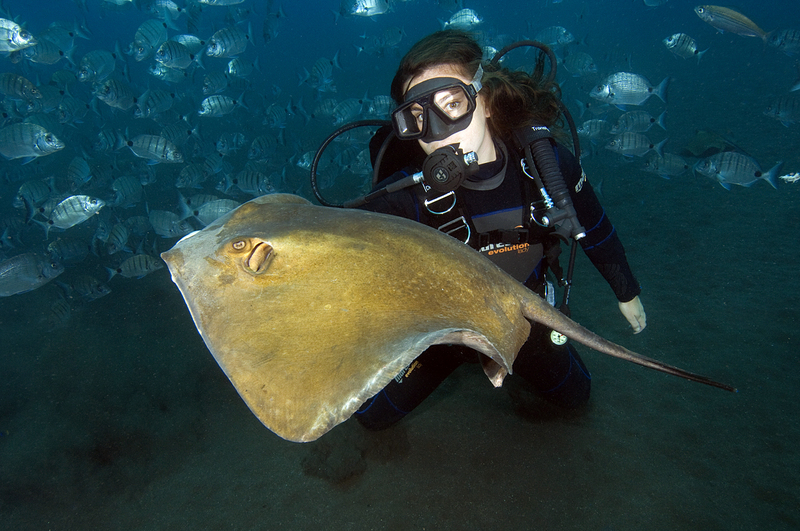 Once the rays settle down, the feeder offers a handful of fish to any divers that want to play one-on-one with the rays, at which point the encounter fragments into a series of smaller tussles. At the end of the dive, any scraps that are left in the barrel are unceremoniously dumped in a heap on the sand. The rays, which are obviously used to this eventuality, immediately bombard the pile of succulent fish carcasses from all directions until every last morsel has been consumed. As chaotic as this encounter sounds, no one has ever been stung by a ray at Los Gigantes. However, there are also many marbled torpedo rays that frequent the area, and quite a few people have been shocked by dropping onto the sand directly over an angry, buried torpedo. Although torpedo rays can emit a painful electrical punch, the jolts have no lasting physical effect. If they have the chance they will also warn divers by lifting off the sand and arching their backs. If you see this odd behavior, try to quickly back away. Rays may abound at Los Gigantes, but shark encounters are few and far between. Although there are not many reef sharks, the area is home to a healthy population of common angel sharks that occasionally venture into the fray. Between organized feeds, they can sometimes be found lurking under the sand in the immediate vicinity.